The Pullback to Buy is Here. But the Pundits Will Worry. The pause to mild pullback eliminated the pause as the bears sunk their teeth into the markets a little deeper on Thursday. 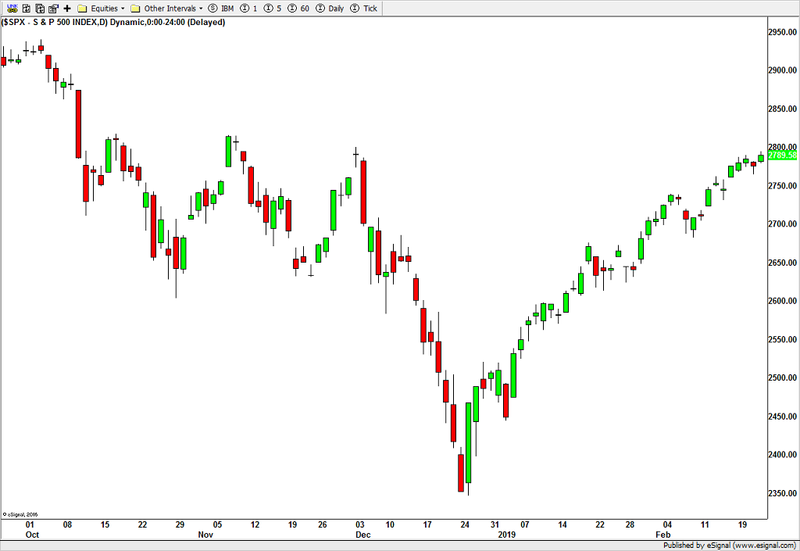 The March 4 peak and reversal day I referenced a few days ago now has a bit more significance although indices saw their highs on February 25. I am traveling so I won’t get to pay enough attention to the chatter, but I am guessing there will be some focus on the S&P 500 falling back to its average price of the last 200 days. Ignore it. It’s nonsense in here because the line is now flat, price can whipsaw around it and the other major stock market indices are no longer all lined up. The S&P 400 and Russell 2000 continue to be the weakest indices, showing a clear “risk off” trend. That flies in the face of conventional wisdom because the dollar has been very strong which should hurt the huge, multinational companies and help those with the most domestic exposure. In other words, the mid cap and small cap indices should be getting a little tailwind over the large and mega cap indices. But as we know, conventional wisdom doesn’t always play out as expected in the markets. 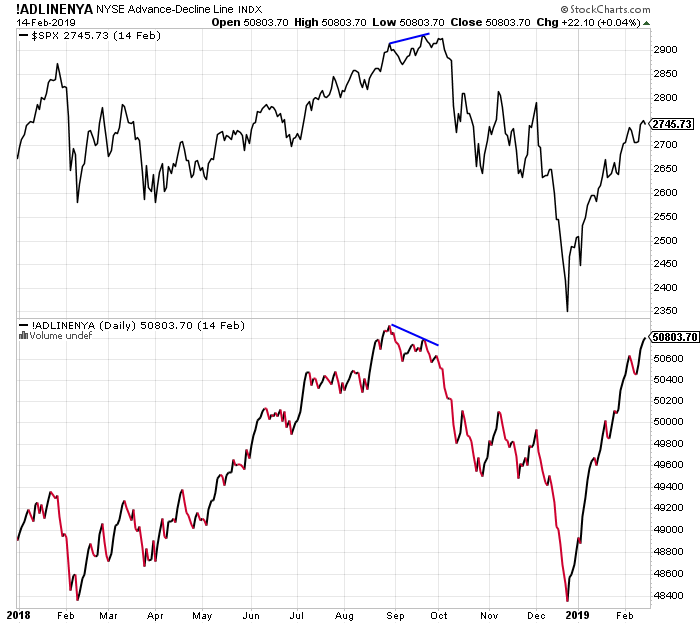 Lots of chatter lately about the Dow Transports below and how much weaker they are than the Dow Industrials. Pundits have almost universally concluded negative consequences. But the data don’t bear that out. More on this next week as it’s time to leave Fort Lauderdale and head up to Orlando. The theme for Friday should be weakness out of the gate. I fully expect the bulls to put up a stand later this morning or right after lunch. The key will come after that when the bears try to knock the markets to new lows. I think a low is coming sooner than later and the big post-Christmas rally ain’t over yet. All those people who have been waiting and waiting for the pullback to buy will probably miss the boat in here as they always do. Now, they will worry that stocks are about to collapse. I am certainly ready to commit the dry powder I have. Stocks are continuing the recent pause or mild pullback. Monday’s action saw the indices reverse to the downside and now we’re watching to see if the market can close below Monday’s lowest level to signal further downside. The Dow, S&P 500 and NASDAQ 100 have exhibited the best relative strength with the S&P 400 and Russell 2000 much weaker this week. On the downside, I wouldn’t expect more than a few percent with the Dow likely to find a little low above 25,000. This is all in the context of the post-Christmas rally being alive and well. Many indicators have suggested that stocks should have pulled back long before this week, but they are all in unison when saying that weakness should be bought. On the sector front, only discretionary is really holding up better than the market. The other three key sectors are under pressure in the very short-term, but still very strong. Defensive groups like utilities, REITs and staples certainly behave well to go along with the more economically sensitive ones. 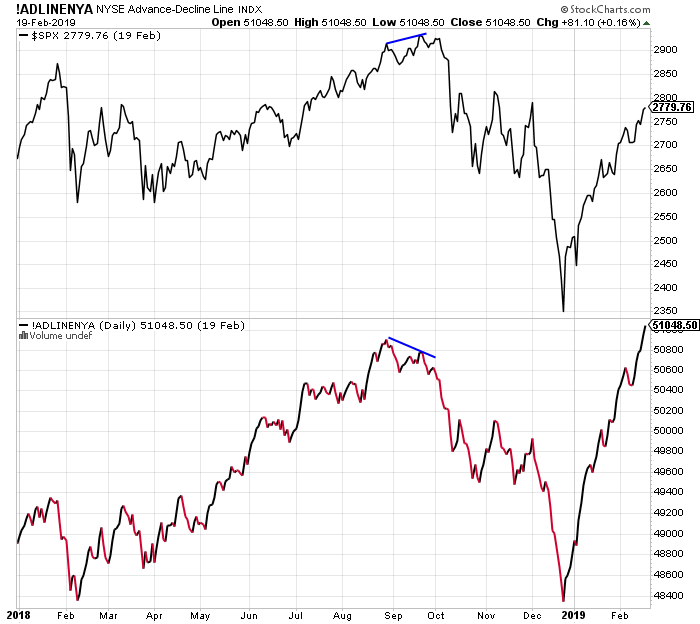 Junk bonds are digesting nicely and the NYSE A/D Line remains a rock. Don’t read too much into some of my negative comments. Stocks remain on solid footing and should mount another assault higher next quarter. All week stocks have been in pullback mode but it sure doesn’t feel like it. What is the S&P 500 down from its intra-day peak? Not even 1%. Overnight trading suggests a test of 2019 highs. Again, when the masses have been sitting in so much cash all year, waiting for stocks to go down 5%, 10% and 15%, it provides a strong cushion against such a decline. The slightest bit of weakness continues to be bought, until it isn’t. And then a real pullback will begin. On Thursday, the government announced that Q4 GDP grew by a much better than expected 2.6%. My non-scientific stab in the dark thought it would be much lower. 2.6% with the government shutdown and collapsing retail sales is astonishing. There continues to be widespread underlying strength against pockets of despair in auto loans, credit cards and housing. I keep hearing the naysayers scream about recession coming next month, but they have been saying that since the election of 2016. It’s really amazing. In my 30 year career, I have watched Reagan, Bush, Clinton, Bush and Obama all preside over varying economies. Almost uniformly, everyone rooted for a strong economy regardless of political persuasion. It’s certainly no secret that I was anything but a fan of Mr. Obama. However, I knew that his success would be my success. For the good of the country and its citizens, we all put politics aside and cheered for economic success as everyone won. Today, very sadly and pathetically, that’s no longer the case. While I understand 100% how polarized our country is and how much hatred there is for Donald Trump, the country has now stooped to a new level. And I have heard it firsthand. People actually overtly and loudly root for a serious recession so Trump will fail in his reelection bid. That’s seems like treason to me. How could anyone hope for unemployment to rise? For people to lose their homes? Wipe away their savings? Raid their retirement accounts? That is about as despicable and disgusting as it gets. After a nearly vertical rise in stock prices since the Christmas bottom, the market seems to have put in a short-term peak on Monday. There is nothing to suggest that this will be anything more than a routine, normal and healthy pullback which could be a few days and a few percent or a longer period of sideways action. On Monday, all five major stock market indices hit recovery highs and new highs for 2019. On Monday, all four key sectors hit recovery highs and new highs for 2019. High yield bonds made new highs on Tuesday as did the NYSE A/D Line. All of this suggests large scale underlying strength and not the end of the rally. Former Trump lawyer, Michael Cohen, testifies before Congress today. I fully expect it to be a circus. It will interesting to see if the markets react to his testimony or questioning. The epic rally from the Christmas bottom continues unabated. leaving more than a few people scratching their heads. The rally just isn’t conforming to historical norms and all those people waiting on the sidelines have been left behind, completely and utterly embarrassed. Actually, most of those people just keep digging their heels in to hate and disavow the rally. I can’t even count how many of those fast money guys and gals look like bigger clowns than they already are. Stocks “should” have paused and mildly pulled back already. But I guess that with so many people watching and waiting, the market just keeps confounding the masses and powering ahead. It’s hard to believe, but the Dow is getting close to all-time highs, something I forecast for later this year. And I have been one of the most bullish on record. Just like when they laughed at my bearish Facebook last August, they laughed when I called for all-time highs in 2019. Semis, discretionary, banks and even transports are all long and strong. High yield bonds are clicking all-time highs. 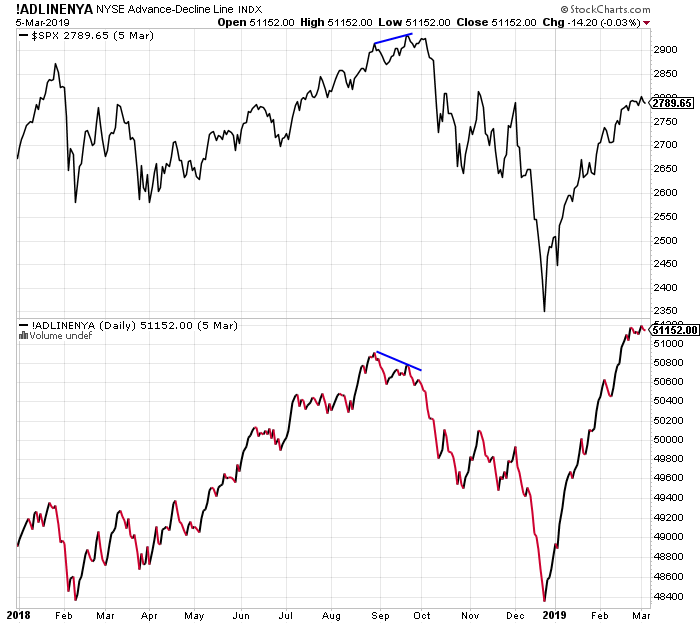 The NYSE A/D Line is at new highs. Eventually, one of these morning rallies will fade and stocks will pause. However, it will either be very shallow and not allow a comfortable entry or will be the beginning of the longer trading range setting in that frustrate bull and bear alike, but the bulls will have all those fat profits to sit on. While stocks “paused” on Thursday, it’s something you can hardly see on a chart. Since the Christmas low, all the market has given back has been one to two days here and there. Remember, in the strongest of trends, a two day pullback is really all you get until the first real trading range sets in to frustrate bull and bear alike. 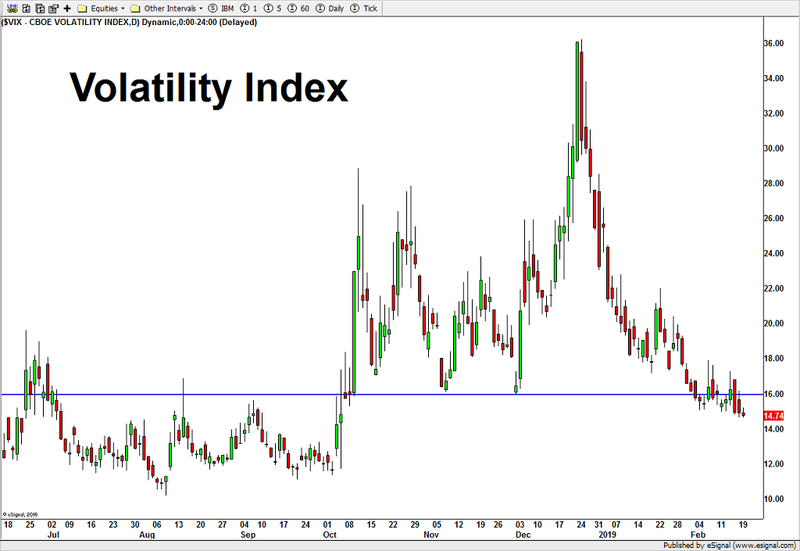 Below is a chart of the S&P 500 followed by the Volatility Index or VIX. As you know, when stocks go up, volatility usually goes down and vice versa. Interestingly and surprisingly, right at the Christmas low in stocks, volatility was at it peak. That is rare and unusual as the VIX usually sees less buying pressure right before it’s about to collapse when stocks bottom. Anyway, for two months I have written about the unmagical level of 16 on the VIX. 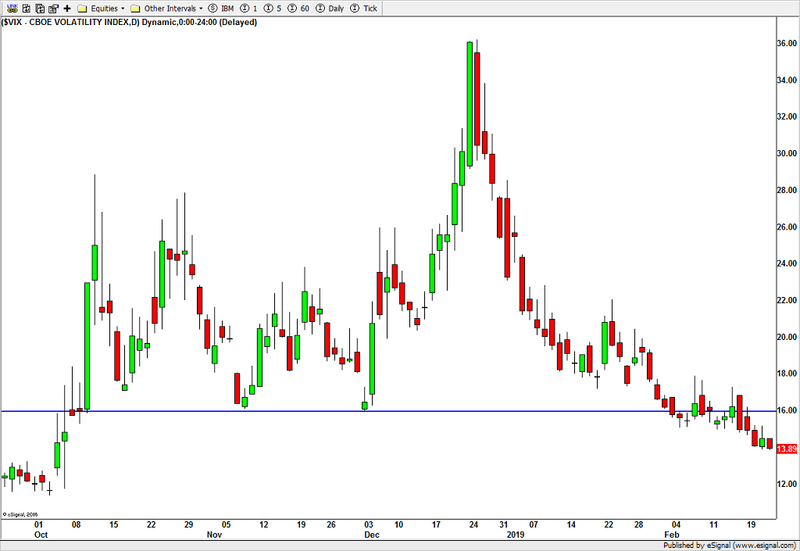 I have been waiting for the VIX to close below 16 to signal another “all clear” for bulls. 16 was important because you can see how it acted as a floor during the Q4 rally attempts. On February 4, it finally achieved that mark. Finally on the VIX, it is now comfortably below 15. If somehow I am completely wrong and this whole huge, epic rally is a bull trap in an ongoing bear market, the VIX would not be below 15. In the 2000 to 2002 bear market as well as the 2007 to 2009 one, the VIX never traded comfortably below 15 until the entire bear market was long over. So, no, I don’t think the rally is over. And no, I don’t think this is a bear market right now. 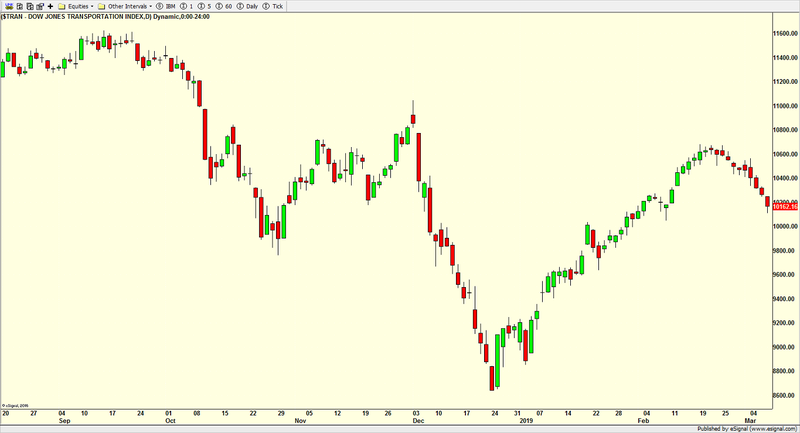 By now there should have been some pullback, any pullback. But no, the stock market continues to defy the odds. Sure, there have been a few small pauses, but nothing close to even a 2% decline. All the way up, naysayer after naysayer just keeps disavowing and hating the rally. I do love how many people continue to revise history and say that they called the bottom and the magnitude of this rally. In my next life, I am coming back as a newsletter writer who never manages money so my performance can’t come back to haunt me when I stink it up. At this stage in the rally, all five major stock market indices are making new highs for 2019. Guess what? So are all four key sectors. And so are high yield bonds. And the NYSE A/D Line just scored an ALL-TIME HIGH! Seriously, what’s left for the bears to point to? The VIX? I said it was going to be late, but it, too, gave the “all clear” when it finally closed below 16. Yes, at some point sooner than later stocks will pause and then pullback. But, I have been saying that for a while. What may end up happening is that when stocks finally pause or pullback, it ends up being a multi-month trading range to set up the next leg higher later in the year. It’s been one heckuva risk on market. The stock market continues to do very little wrong. Since the Christmas bottom it’s been almost a mirror image of the relentless selling wave I mentioned so often for two months. In fact, as I wrote this, the stock market has just recovered 100% of the losses from that final, nasty sell off. Recall that the almost unprecedented wave was where stocks closed lower than where they opened for 10 straight days, likely not seen since the 1930s. Additionally, stocks closed in the lower half of their daily range all 10 of those days, which has not likely been seen since the 1930s although without intra-day for the 1970s, it is possible this behavior occurred then. The bottom line as I discussed many, many times, that was one heckuva selling wave in December. 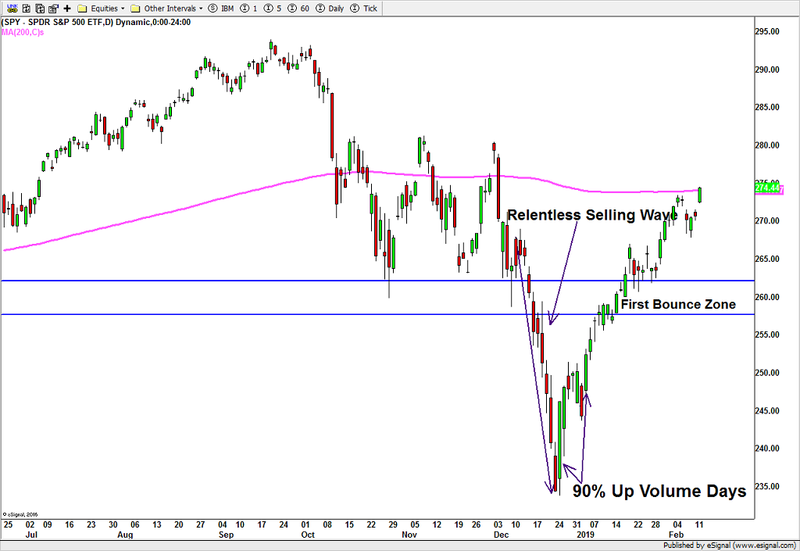 Since the Christmas low, stocks have bounced very nicely in a complete reversal of behavior and even past the zone I first forecast on December 21. I recall being countered by other pundits that stocks wouldn’t even see my zone by April. The selling was supposedly too widespread and damaging. So many pundits, analysts and members of the media were calling for a new bear market. While that final relentless selling wave saw mostly red days on the chart below, the rally since has been mostly green days, meaning that stocks have closed higher than where they opened. Since the Christmas trough we saw two separate days where the percent of volume in advancing stocks was greater than 90%. That’s very powerful and usually leads to extended stock market gains. Additionally, there were a number of “thrusts” seen which really means that the number of stocks going up over a certain time period completely and utterly overwhelmed the number of stocks going down. In other words, more confirmation that the Christmas bottom was a major one. Finally, the pink line on the chart below represents the average price of the last 200 days, more popularly known as the 200 day moving average. It’s a widely viewed way to define the long-term trend. Sometimes, because many managers act on this for some odd reason, price can bump up or down against it and then pause or move in the opposite direction for a spell. Computerized trading programs love to push markets around popularly watched areas like the 200 day moving average and force others to pile on. 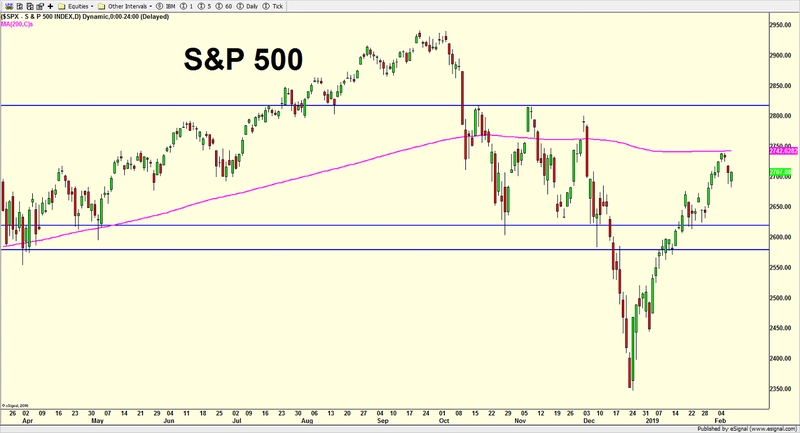 I mention all this about the pink line because the S&P 500 just hit that area on Tuesday as you can see below. I would venture to guess that the computer algos had a hand in this. More than likely, stocks are about to either pause or mildly pullback 1-2%. All of the aforementioned can be seen in the chart below.